You know how when you go to a zoo (or maybe to a park with lots of wildlife), they have those “Please don't feed the animals” signs up all over the place? Please don't ride the elephants. Not long ago, when I first started thinking about my travel bucket list, “riding an elephant in the jungle” was something I dreamt of someday doing — right up there with riding a camel in the desert and a horse on a beach. But then I started learning snippets of the truth about elephant tourism, and I quickly struck that item off my list. 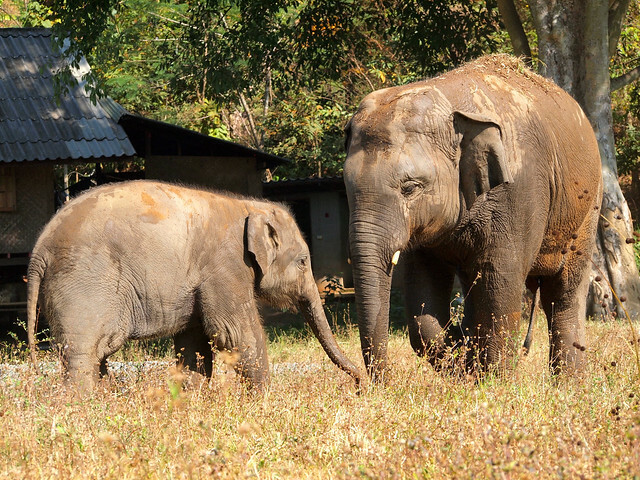 In Southeast Asia, elephant tourism is a booming business. You'll see baby elephants making paintings for paying tourists, young elephants performing on the streets, and endless ads for elephant trekking camps that allow you to ride that elephant in the jungle. But, knowing what I know now about the plight of elephants in Asia, I would advise you to avoid ALL of these things. Elephants are very intelligent animals, and are definitely capable of being trained. Unfortunately, the “training” that happens in Thailand (and many other places in Asia) has nothing to do with positive reinforcement and everything to do with torture and fear. Those that survive the phajaan emerge broken in every sense of the word — and now fear humans enough to listen to any command they are given. These elephants go on to be the ones you see in circuses, or painting those pictures, or in those trekking camps in the jungle. In these “jobs,” the elephants are often chained up, prodded with bullhooks, and sometimes even shot with slingshots. Other “trained” elephants go into the illegal logging trade, which is perhaps the worst fate for an elephant; many die young from broken backs and other injuries. One hundred years ago, there were hundreds of thousands of wild elephants in Asia. Today? That number is just in the thousands. Deforestation and other development has claimed the elephants' natural habitat over the last 100 years, leading to Asian elephants being considered an endangered species. So why are people able to enslave them? It's a funny thing, the relationship Asia has with elephants. In the Hindu and Buddhist religions, elephants are sacred. But the animals have also been used for centuries as work animals, and are now integral to the tourism industry. And, once an elephant goes through the phajaan ceremony in Thailand, it is then considered nothing more than domestic livestock; it is no longer a wild elephant that can be protected. 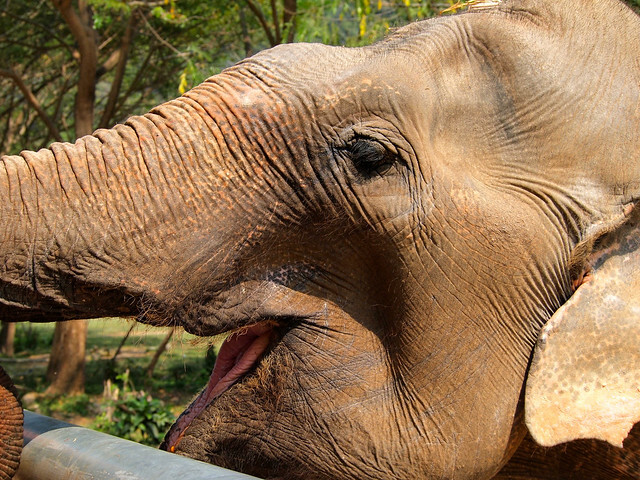 In recent years, the elephant-powered logging industry has been banned in Thailand. But many mahouts simply take their elephants over the border into Burma, or just continue logging illegally in Thailand. They need to make a living, too, they argue. And elephant tourism in Thailand has only increased. Everyone, after all, wants to ride an elephant in the jungle. During my recent trip to Thailand, I spent time at an elephant sanctuary called Elephant Nature Park. It is run by a woman named Sangduen “Lek” Chailert, who may be one of the most inspirational people I have ever met. Lek lives her life for the elephants. She has been disowned by her family, blacklisted by the Thailand Tourism Authority (because she shows people videos of the phajaan), and has even had threats made on her life. But still she has persisted in her mission to rescue abused elephants and give them a safe place to live out the rest of their lives. ENP has a growing herd of elephants — the number currently stands at more than 40 — that have all been rescued from depressing situations. Many came to the park with broken bones, infections, landmine injuries, or blind eyes. And all arrived with broken spirits. 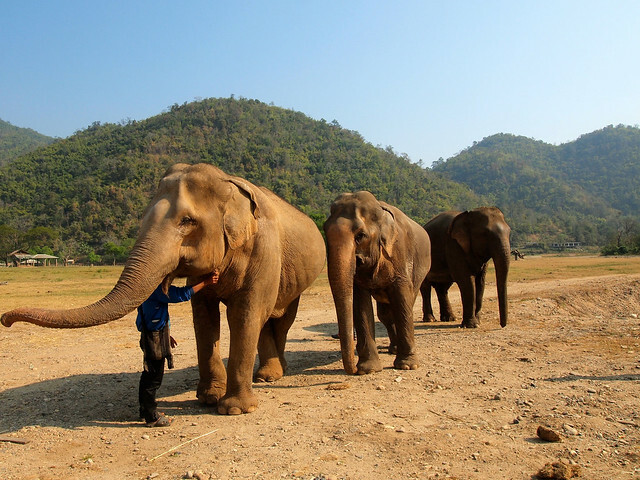 Lek treats these elephants like her children. She sleeps outdoors with them if they are anxious; she sings them lullabies to soothe them to sleep; she strokes their trunks and scratches their ears and looks at them with nothing but love in her gaze. And the elephants respond to it. 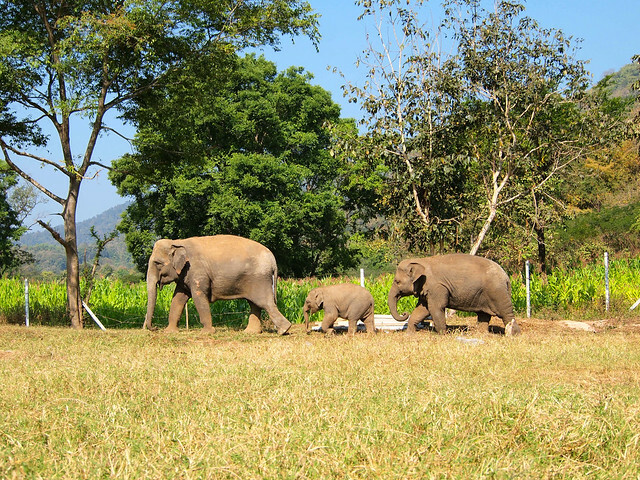 Despite what they have been through, the elephants at ENP have adapted to life at the sanctuary. 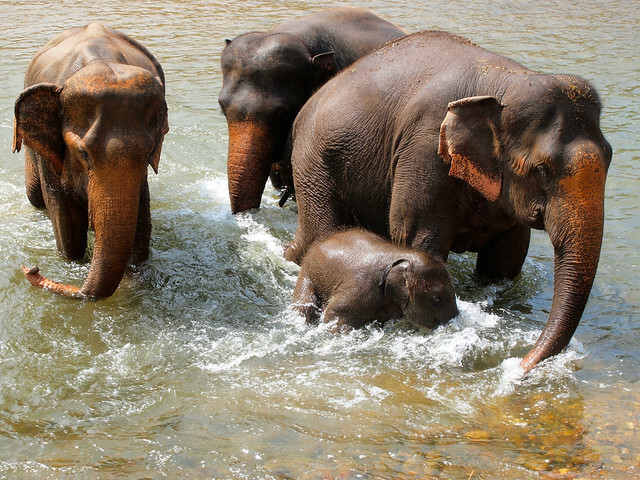 They have formed family groups; some have even conceived and given birth to adorable (and mischievous) baby elephants. They play in the mud and roll around in the river. They mourn friends and adopted family members when they pass away. They are emotional. They are smart. They are full of personality. And they are not animals that should be used for any tourist's amusements. I'm not dedicating this whole post to Elephant Nature Park, though (I'll save that for next week — stay tuned!). Instead, I'm dedicating it to the elephants. People who have gone to Thailand and ridden elephants aren't evil; they aren't bad people. But, more likely than not, they were uneducated. Uneducated about how these elephants are trained, and uneducated about the fact that an elephant's back — big as it is — is not actually strong enough to carry heavy loads. It's why many of the elephants at ENP have suffered broken hips and legs and even backs back during their logging and trekking days. 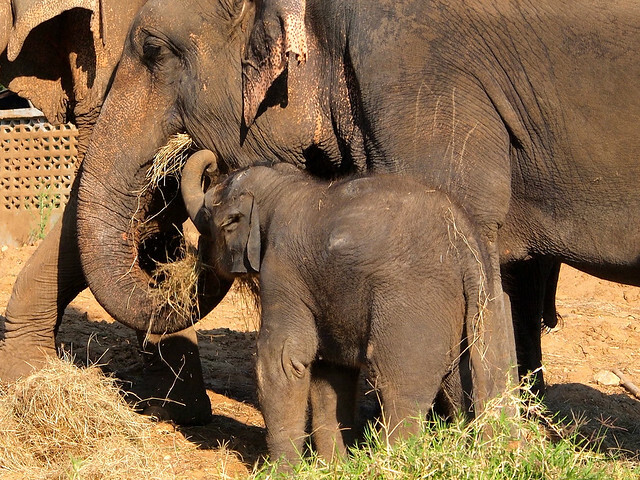 Yes, ENP rescues elephants from sad situations when it can. But the organization's larger goal is to turn the uneducated into the educated. Because, the more educated we are, the better decisions we will be able to make when we travel. It’s so so sad to learn about this. I have been reading a lot about it in the last year and it breaks my heart because 2 years ago in India I did ride an elephant- although it was a spice plantation I’m not sure what their conditions were… I’m assuming since they allowed people on them, they must have been tortured and “broken”. so so sad. But now you know better, Rachel! And that’s really half the battle. It IS really sad, but knowing that places like Elephant Nature Park exist makes me feel at least a little bit hopeful. I’m so glad you wrote this post Amanda. So, so, so many tourists view this is a fun, holiday experience to have while in Thailand and I wish more people would stop to think about what they are actually supporting. I agree Megan. And, on the outside, it DOES look like just a fun holiday experience. The good news is that a lot of people are now speaking out against the trekking camps and the tiger temples and the other places in Thailand that exploit animals. Hopefully eventually things will change. Thank you for writing this piece. I’m sad to say that I rode an elephant in Bali on my first trip overseas in 2008, but knowing what I have learnt since I never would have done it. I think education and awareness about what these gorgeous creatures go through is lacking amongst the wider population, and more articles like yours can only help to improve this. Wow… how sad that the Tourism Authority would want to shush someone speaking out against this. I’m sure if more people knew what was behind elephant tourism they would not want to participate. Thank you for sharing this post and helping to spread the word! But times change. And now I think we’re approaching that time where people are willing to look a bit more critically about how they spend their tourist dollars. 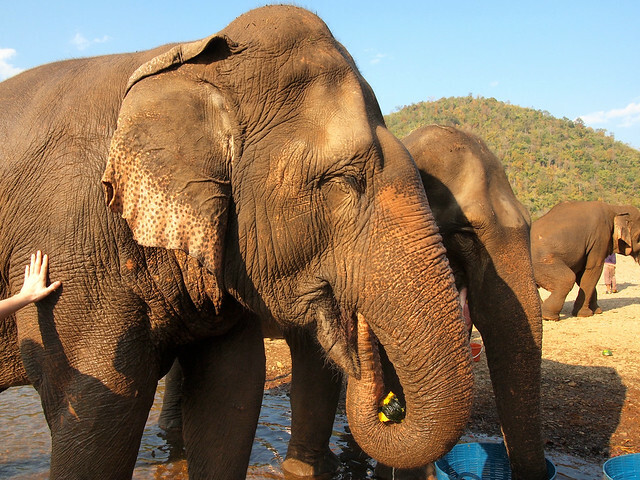 What Lek is doing – offering ways to interact with elephants withOUT riding them – proves that it definitely can be done, and I wouldn’t be surprised to see more trekking camps following her lead in the future. I am always conflicted about animal encounters like this. I want to be close to the elephant/dolphin/etc. but I don’t want the animal to suffer for my experience. It’s information like this that shows it really is better to admire from afar and respect the wildness in the world. As much as I love the elephants, I will think of you’ve told me when I am tempted to get too close. Thanks. I have read a lot about ‘not riding an elephant’ and ‘their plight’. I feel so strongly for the issue that I keep educating everybody that I meet in person too. I commented on one of my friends’ pic on Facebook where she sat on an elephant that it’s not right! She was also moved to read about their misery! I appreciate this initiative of awareness. Love all the photographs! The best way to stop abuse is to tell people about it – and that doesn’t just apply to elephants, of course! It’s great that you speak up, Renuka! Yes!! More people need to understand this! Some friends of mine recently went on their honeymoon to Thailand and were so excited about riding elephants. It was all I could do not to chew them out, but they didn’t mean to support cruelty; they were just ignorant. There’s a documentary being made about this right now, which hopefully will raise peoples’ awareness and show better ways to interact with these amazing animals (like ENP). Definitely go to ENP if you can, Lisa! It’s a great place to learn more about elephants and about what you can do to help them. It really pisses me off that I actually did ride an elephant in Chiang Mai several years ago. Wish I could take that moment back. I didn’t know about all of this back then, but the way the guy treated that elephant was appalling–my friends and I cut the excursion very short. Reading this, though, makes my blood boil. You definitely aren’t alone! I’ve talked to plenty of people who have regretted riding an elephant immediately afterwards due to how the animal was treated during the ride. I don’t care what anyone says; if there’s a bullhook involved, it’s cruelty to the elephant. Please do not misunderstand my comments – I am an animal lover, I think i love animals more than humans – modern mankind can be an evil beast !! The plight of all animals tamed by humans can be told as a sad story, dogs, horses, elephants, killer whales, dolphins – the list is endless. My wife would not go to Seaworld in Florida on account of her love for animals. In India once we stopped at the roadside on our way to the Taj Mahal from Delhi, out of the bushes came a boy with a dancing bear, it made us sick!! In Thailand we saw a mahout with a baby elephant at the roadside who was clearly distressed, we stopped and paid 100thb for a 20thb bottle of milk to feed him, we questioned the mahout about the elephants mum and why he is rocking side to side – until he eventually walked away ashamed! However there are many faith restoring stories like ENP, there are mahouts that love their elephant more than their family and work them in tourism or logging or road building. There are farmers that treat their sheep/cattle/pigs with respect and care, even though they are going to end up on the dinner plate. Horses in the western world are all “broken” – Dogs are “trained” – pigs/chickens/sheep are “farmed”. It is down to us individuals to make informative decisions as to whether or not to support these animal masters, be it a mahout in Asia, Seaworld, Mc Donalds, or your regular supermarket. Finally I think you should name and shame the camps you have come across that mistreat their animals. I’m so with you – this plight is not unique to just elephants (I can’t even THINK about going to Seaworld again after watching “Blackfish”!). It’s all just about education, though, and about talking more about the mahouts and farmers and trainers who are doing things with a gentler touch. And as for naming and shaming amps that mistreat their animals… God, there are too many to name in Thailand. In my opinion, ANY trekking camp that uses chains and bullhooks on its elephants could be considered abusive. Elephants DO have very thick skin, but it’s also quite sensitive skin. Good for your son for speaking up! Wonderful post Amanda. It makes me so sad hearing about the way people treat poor defenseless elephants (and all other animals for that matter). They are such gentle creatures who deserve our respect and care. I agree, Jen! And it boggles my mind that elephants are considered sacred animals in many Asian religions, and yet they are still treated this way! Amen sister. This post is well said and much needed for all those who are visiting SE Asia. It breaks my heart when I see animals being abused purely for tourism. Same here, Alison. Hence why I want to make sure to write about it! Thank you for bringing more awareness to the plight of the Asian elephant. ENP is a wonderful place to go as a volunteer where you can spend time ‘up close and personal’ with the elephants that live there. You will never have such an experience anywhere else. Part of your daily routine at the park is to prepare food for the ele’s and feed them, bathe the elephants in the river, walk with them and talk with them. Lek and her wonderful team deliver education and awareness, and share amazing stories of hope and survival. I highly recommend travellers to Chiang Mai visit ENP. I look forward to your stories of the park Amanda. Yes, ENP is a fantastic place, and I really hope more camps in the area start to follow Lek’s example! It is so great to see more and more people catching on to this. We worked at Elephant Nature Park for 7 months and were very close with Lek. She taught us a lot about what goes on with Elephants (as well as many other animals when it comes to Animal entertainment) It is great to educate tourists but hopefully the owners of these elephants will wake up sooner then later and realize that they are not machines. We decided to go to a few trekking camps to see what really goes on and it is heartbreaking. People get so happy when they see an elephant paint a picture or shoot basketballs through a hope. It was very depressing to see how many people enjoyed these shows. We have also written a blog about the truth about Elephant tourism and we invite you to check it out. Thanks so much for speaking up. I agree – it’s the elephant owners who really need to change their attitudes. If only they could see that people are willing to pay even MORE money to visit a place like ENP, knowing that they are helping to do some good rather than just seeing elephants perform. If more of the camps in that area would follow ENP’s example, think how great it would be for everyone! Such a great post on such an important issue. Too few people know about this! Thanks! And I agree – more people need to know! Heartbreaking. And something we all need to know and internalize. Thanks for this insightful post, Amanda. Thank YOU, Shivya. Knowing that people are responding to this so much means a lot to me! I have to confess, I did ride an elephant in Laos in 2009, back when I was a naive backpacker before I knew better. Nowadays, I would urge anyone I talk to about it not to. Well it’s good that you’ve changed your mind about it, Sam! That’s the most important part. Wow! What a great and powerful post. It’s so sad to hear. Hopefully, more people will read and hear about this and stop riding the elephants. I want to go on a safari one day, but to see them in their natural habitat, not to ride them (I’m just too much of a chicken!) thanks for writing this. I’m doing my best to help spread the word! Thank you so much for writing this! I didn’t know all these details, like about the elephants being ‘crushed’ at a young age, but I’m not really surprised. It’s terrible hearing stuff like this but so important at the same time to spread awareness. It was hard enough for me to watch some scenes in the film ‘Water for Elephants’…I hate to imagine how often this happens in real life. 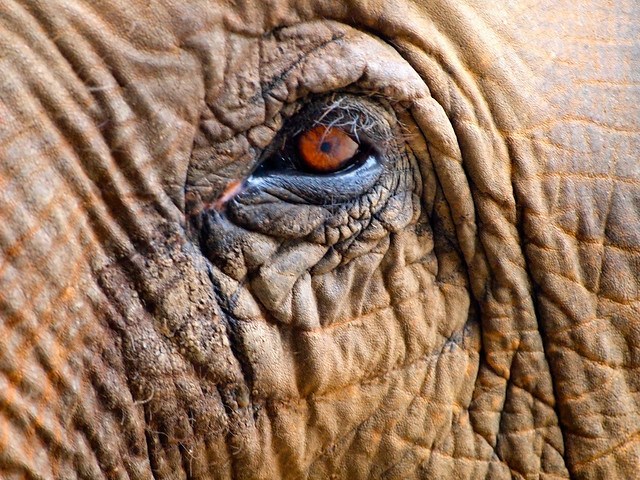 Beautiful pictures by the way- I love the close up of the elephant’s eye! Oh my gosh, I just watched “Water for Elephants” again on TV yesterday, and yeah, there are moments in that movie that make me SO SAD, especially now that I’ve learned so much more about elephants. I couldn’t agree more, upon seeing how they are treated on my visit in Thailand this is just too cruel! It really is quite sad. Hopefully the more people we tell about it though the better it will become for the elephants! I was so heartbroken when I first heard about this! But thanks for putting this out there for people to read and understand. Traveling ethically is important and awareness is key with that. Thanks, Daryl. I definitely agree with you – ethical travel is important, but we can’t be ethical if we aren’t aware of what’s unethical out there! Many people just don’t realize how cruel elephant “training” is. I’m sure if more people knew, they wouldn’t be riding elephants. I would love to see elephants in the wild! I had no idea that’s how they ‘domesticate’ elephants, how heartbreaking 🙁 I am sadly one of those people who rode an elephant on my first trip to Thailand because I was clueless as to how awful it would be. My guide didn’t use a metal hook but he did have a big bamboo stick that he would slap the elephants head with. My poor elephant was covered in scars. After getting off, I looked into the elephants eye and cried a bit andapologized to it for what he had gone through. sounds silly but it’s all I could do 🙁 never again and I tell anyone I can about how terrible it is so even if I’m able to change only one persons mind about doing it I’ll feel good about it. Your experience is similar to many others’, Katrina! Most people just have no idea. They assume that the elephants must like the work they’re doing (after all, “they’re so big!” and how could a human really MAKE them do anything?). I’m glad though that now you try to educate others! That’s really the best any of us can do. AMANDA i am too much upset after reading this post, after all i love elephant safari too much, well i will take some precaution while riding the elephant.. It doesn’t really matter how much precaution you take – riding them is still sort of cruel. See if you can find a different kind of safari next time – maybe one where you walk alongside the elephants instead of riding them! Amanda, I just came across this post and so resonate with it. My experience was with camels in Gran Canaria last month. My friend really wanted to ride one, and we hadn’t given too much thought to the ethics of it at the time. When we got there they put us on a camel that was clearly in distress, constantly crying, and tried to tell us “oh he’s ok, don’t worry” when we started asking questions. We both felt very uncomfortable and made them let us off. Then they tried to pressure us to get on another one. There was no way that was going to happen after we literally watched them disregard an animal that was so clearly upset. We both were in tears after that experience. We’ve left bad reviews of the company and contacted some animal rights organisations. But I am now going to be extremely cautious and thoughtful about any potential future interaction with animals on my travels. Thank you for writing posts like this that get this information out there. There’s definitely a fine line when it comes to any sort of animal interaction – even horseback riding should be approached with caution, because in some countries horses aren’t very well cared for. Last year we went to Thailand and did ride on the elephants. Have to say it was hazardous as the seat was slippery, and when the elephant was walking down a slope, my 5-year-old was sliding, and I had to keep hold of him tight. I noticed elephants kept asking for food and could only get it as a reward by walking. I felt sorry for them. Then when I came back and watched some video of a tourist riding on an elephant, I noticed the elephant was walking strangely. The elephant clearly had a problem with its legs. That put me off from riding an elephant again. Then I come onto your post and find out how they are ‘trained’, I feel even more strongly to never ride one again and advise others not to as well. I’m sorry you had such a poor experience, but am glad that you are a bit more educated about it now and don’t plan to do it again! May we all help spread the word lovingly and diplomatically to help educate millions globally to stop these cruel practices to our amazing elephants and to creatures large and small, everywhere.